Diana monkey, an Old World monkey found in West Africa. The apposability of the thumbs and great toes enables primates to grasp objects. 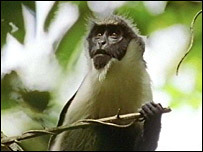 Tree-living monkeys (A, D) have apposable great toes but not thumbs. 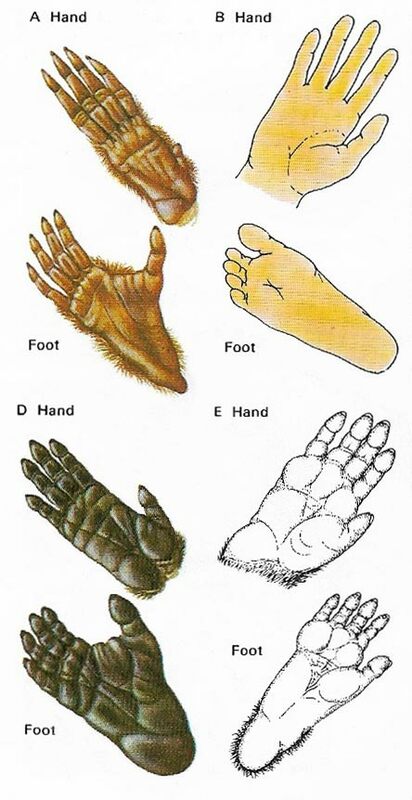 The human hand (B) has apposability but there is little flexbility of the big toe. In ground-living monkeys (E) fingers are short; thumbs and great toes cannot be fully apposed. A monkey is a primate that is also a member of the superfamily Ceboidea (New World monkeys), found in South and Central America, or Cercopithecoidea (Old World monkeys), found in Asia and Africa. Monkeys are long-tailed, medium-bodied, and either arboreal or terrestrial quadrupeds. New World monkeys include the capuchins, spider monkeys, howler monkeys, and marmosets. Old World monkeys include the macaques, baboons, and langur monkeys. The main different between the two is in their nose shape. Old World monkeys have their nostrils closer set which gives them a pronouced nose. The nostrils of New World monkeys are set wide apart giving them a flattish nose. Grasping or prehensile tails are found only in species of New World monkeys but all monkeys, with one exception (the night monkeys or douroucoulis) are diurnal; they sleep at night and are awake during the day. Both types of monkeys are social animals, living in groups with a well-developed hierarchy. Some Old World forms such as the baboons, have largely deserted the trees to take up life on the ground. But they are still good climbers and when threatened can scamper to safety among branches or rocks. Most monkeys, such as the langur (family Cercopithecidae), scamper between branches, holding on with both hands and feet and using their long tails for balance. Some monkeys, such as the macaque (family Cercopithecidae), walk on all fours, putting their ands flat on the ground.